Mozilla Firefox with its multi-process architecture enabled is still the web browser with the best memory performance according to Mozilla. Our own memory benchmarks saw Firefox lead the pack in 2012 and 2014 when we compared the browser's memory usage against Chrome, Opera and Internet Explorer on Windows. Mozilla did run tests of its own last year, and ran them again this year with multi-process versions of the browser. Multi-process architecture separates the browser from content processes in Firefox. Mozilla estimated last year that Firefox would use about 20% more memory with a single content process added, and more if more processes were used by the browser. The new test conducted by Mozilla takes different content process configurations into account. More precisely, Mozilla ran the same test that it did last year with 2, 4 and 8 content processes. Mozilla's loaded 30 web pages of the Alexa top 100 in their own tabs, with 10 seconds in between loads, and looked at the memory usage of the browser in the end. The result, as you can see on the graph above is that Firefox is very memory efficient. This is particularly the case on Windows and Linux, where the memory use difference is significant. Firefox uses more memory if more content processes are added, but the difference between 2 and 8 content processes is not as problematic as Mozilla assumed last year. On Windows 10, memory performance increased by about 300 Megabyte from 587 MB to 905 MB with eight content processes enabled. On Linux, memory usage rose by just 125 Megabyte under the same eight content processes. The difference is not as spectacular on Mac devices. Firefox with two and four content processes uses less memory than Chrome, but the difference is just 150 Megabyte at the most. The eight content process version used even more memory than Chrome on the operating system. Chrome used 1478 MB on Linux, 1382 MB on Windows, and 1365 MB on Mac OS X.
Mozilla's plan is to increase the number of content processes to four in the near future. This would make Firefox use less memory than Chrome on all platforms. On two, Windows and Linux, it would use considerably less than Chrome. It needs to be noted that Google Chrome uses one content process per tab by default. Firefox's memory usage would increase more if Mozilla would enable this as well. Tip: you can tame Chrome's memory usage by enabling processes per site, and not tab. This works for other Chromium-based browsers as well including Vivaldi and Opera. If you use Firefox, check out our guide on optimizing Firefox's memory use. You can run the tests by yourself, as the tools that Mozilla used to run the benchmarks are openly available. It appears at least, that Firefox is still the most memory friendly user in 2017, and that the switch to the multi-process architecture has not changed that. 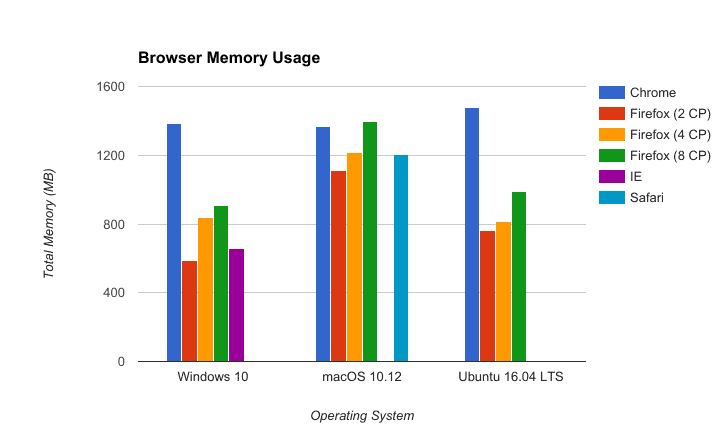 While memory use increased, it is still better than Chrome, IE or Safari even with multiple content processes enabled. Now You: Do you care about your browser's memory use? I am on a 2GB laptop. When using Chrome the heat exhaustion fan will go crazy like it’s going to explode. That’s why I prefer Firefox. I don’t care for memory usage this days because RAM is so cheap to buy and today computers when you buy comes at least minimal 4GB of RAM. Most important thing is performance and Chrome is way of head of any browser out there. Its feels so smooth and fast while Firefox hangs sometimes and open pages slow. The new mobile theme should be live in the next 24-48 hour period. Memory usage shouldn’t be concern, unless it is memory leak. Also that use case it definitely not for average user but rather power one, and if you are power user – you for sure value your time and get enough ram for the job. The point of memory is to use it. Especially for browsers. Using memory–say, for caching–helps speed things up… and we’re back to the point. I don’t car about RAM usage all that much, unless I am using low end/older hardware that is not upgradeable. Otherwise, what matters most to me is battery usage and performance of the browser. Battery usage is the primary reason to still use Edge and Safari, over the competition. Agreed, not only that, but Chrome doesn’t start playing videos until you go to that tab, so I can line up YouTube videos to play in various tabs without it lagging the browser and having to pause each one. If I were to disable autoplay (which isn’t the same as what Chrome does but is the closest thing) in the Firefox about:config then it breaks YouTube completely and videos don’t play at all. Cheers :P that’s useful, should be an option within the actual settings menu. This is the most amateur benchmark I ever seen. Those benchmark results give zero information other than you opened up some tabs for a time. You cannot rely on stats provided by the browser’s company. They pick and choose the data that allows them to say their browser is the best. MS and Google will do the same thing. Don’t judge by the stats. Judge by your own experiences. In my experience, FF is a true memory hog. That is why I went to Pale Moon and Chrome. I now have 16GB of RAM. so memory is not an issue. But, FF’s performance pales in comparison to Chrome and Pale Moon. Mozilla is a company struggling to hold onto users they have offended with each and every big update. So they are trying to do a quick sell on their floundering product. Just let it die already … eh! Going from my usage of both Firefox and Chrome, Firefox used to be lean, but then it became so bloated and slow, whereas Chrome has been much better in the past 10 versions and actually uses less memory than Firefox, even with double the tabs open in Chrome. I care about my browser’s memory use, as nothing else uses as much RAM as the browser. 2 GB here, and it’s enough for all my needs and can’t be upgraded so easily. Firefox and Pale Moon are the lightest, but I can live with Opera (or Chrome if I have to) especially after the “process per site” treatment. Vivaldi is a bit heavier. The main thing is that after using a Chromium-based browser for a while the rest of my PC seems to slow down, and memory goes to swap, while it never happens with Firefox, it’s more polite in that regard. It was like that for me on Windows, and still is on Linux. As many have already commented, I think the equation has shifted to things like overall responsiveness throughout the browsing session, how the browser pages out unused tabs but fetches them quickly after a hibernated/sleep session, how it recovers memory upon tab closing, and how it prevents process memory leaks. Firefox’s responsiveness is really bad compared to Chrome. I think Chrome’s super fast graphics renderer might be the reason for that and the fact that it doesn’t use XUL. i have an older notebook, so memory usage is a concern. what i see is that firefox memory usage increases a lot when have it open for a long time. it is ok after few hours, something around ~800mb (but lots of addons). after 3 days of use it piles up to something like 1500mb, although the unused tabs get unloaded through an addon. but i don’t know if this is a browser issue or a bug/leak in one of the addons. The easiest way to find out is to run the browser without add-ons, and see if memory increases in similar fashion. i know. the problem is: as said, it takes a long time, and using firefox without “my” addons seriously is a pain. and after all, it wouldn’t make any difference if i find out. if one of theaddons is the culprit, i would need to try again with only some of the addons etc. that would take half of the rest of my life. about:memory is not much help for me either. also “clean memory usage” doesn’t do really much. it’s the “private bytes” that pile up… and up. the “working set” never gets as high. also, an increasing memory usage after hours of browsing probably is normal to some extent. but maybe not as much? once i reach the 1.5gb i usually do restart firefox, because also the performance clearly gets worse. I suspect add-ons may not be the problem. I run Firefox without add-ons on my Linux desktop and run into the same problem. If I leave FF open on my desktop for a few days, memory usage goes from, say 500-700 mb when first opened to as high as 7 GB (I have 8GB total RAM). My entire system also becomes less responsive over that time as well. Why no processor usage / time performance tests? Firefox always had serious memory leak problems, something they’re not focusing much on anymore because in the future, apparently, there are going to be major changes (sadly for many current Firefox users) that would make rewriting large parts of the current code useless. Or at least that’s what I think is going on. In my experience, though, Chrome with its multiprocess design ends up using much more RAM than a fresh copy of Firefox or Pale Moon. Anyway, Firefox allows, with about:memory and the about:addons-memory addon, an accurate analysis of what’s using how much. I appreciate memory efficiency. But I’ll take Chrome’s performance and stability at the cost of more RAM usage any day. I do agree that memory usage matters. Systems tend to slow down when a browser (or any other app, like CAD/graphic) takes a lot of memory. Isn’t the CPU taxed as well to maintain all there opened tabs, links to locally saved content etc? Personally I’m using session manager addon for palemoon as ussualny we have tens of tabs opened simultaniously (especially my wifes “do not think about closing MY TABS!”). And when memory usage increases above let’s say 1GB or I start to notice that the browser/system slows down, I just save session and restart it. Usage drops, responsiveness tops to normal :). I just wish there was a possibility to automate it. I guess an addon would be neccessary to monitor memory usage, prompt user that restart is immanent, save and restore session. Mr Brinkmann – thanks for reminding article on FF memory usage optimisation. However, the latters seems to bo more “responsive”. I always felt PM choppy compared to FF anyway. Hmm, I posted something here about 2-3 days ago and does not appear. Why censor me? Sorry, found it in spam. It is now live.